This section refers to Spreaker Studio for iOS. Why can't I broadcast for longer than 15 minutes? Can I broadcast live and/or record a podcast beforehand? Why can't I play tracks and use the microphone at the same time? What is the Push to Talk button in the console? What is the difference between the Console view and the Playlist view? How can I remove tracks from the Playlist section of the Spreaker Studio for mobile app? Can I pause in the middle of recording? Is it possible to chat while broadcasting live? Can I add more sound effects? How can I deactivate recurring monthly payments? I've already subscribed to a Pro plan through Spreaker's website. Is it possible to upgrade again through Spreaker's app? I've already subscribed to a Pro plan through Spreaker's app. Is it possible to upgrade again through the website? I've already subscribed to a Pro plan through Spreaker's app. Is it possible to upgrade again through the app? Free Speech users can only broadcast live for up to 15 minutes at a time. To go live for longer, upgrade to one of our PRO plans. You can broadcast live if you've got internet access. If you don't, you can still record a podcast, and then publish it once you're connected. You can only add audio files to Spreaker Studio that are already on your device. Spreaker's web-based Music Library is not available on the app version. When Auto DJ is enabled, the songs you had set up in the playlist will play in a continuous queue, from first to last without interruption. You can use the microphone and play tracks/effects at the same time only if you plug in your headphones. This is done to prevent audio played through the speakers to re-enter through the mic. Hold down the "Push to Talk" button whenever you want to broadcast your voice. You can also lock the microphone into the ON position by sliding the Microphone toggle at the bottom-middle of the console. The console view gives you full control over the volumes of the songs you've added, and allows you to play two songs simultaneously (you'll be able to see it once you've uploaded a track). The playlist view is a simpler interface and does not allow mixing. However you can use the Auto DJ function to start playing your list of songs without interruptions. 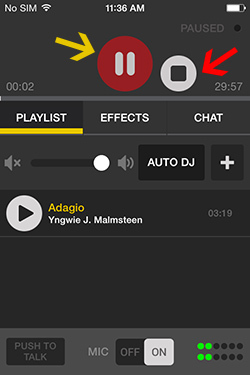 To remove a track from the Playlist, tap the "+" at the top, next to the Auto DJ button. Then, swipe the track you want to delete either to the left or right. At the new message: Want to remove this? simply tap on OK.
How do I import drafts made with other apps into my Spreaker app? If you have audio files you've created with apps on your iPhone or iPod, you can import them into the Spreaker app as drafts to be published. Watch our video tutorial on how to go about it. Yes, you can pause your broadcast at any time and continue when you feel ready, but only when recording offline, or off the air. In the image, the button marked by the yellow arrow is the one you have to tap in order to pause as well as restart your broadcast. The one marked by the red arrow will end the recording and direct you away from the console. Yes, during a live broadcast, just tap on the Chat tab on the right and jump in the conversation. Yes, you can. Under Effects, tap on any circle with a "+". You can add audio effects already located on your device. Once you've subscribed to a Pro plan through Spreaker's app, your credit card information cannot be modified through Spreaker's website. Instead, you can make any necessary changes via iTunes. Once you've subscribed to a Pro plan through Spreaker's app, automatic monthly billing cannot be canceled through Spreaker's website. Instead, you can make any necessary changes via iTunes. Once you've subscribed to a Pro plan through Spreaker's website, you can only upgrade again through the site. If you've subscribed to a Pro plan through the app, and the subscription is still active, you can only manage your account through the app. You cannot upgrade directly to a bigger Pro plan from a smaller one through Spreaker's app. Instead, you must first cancel your current subscription, wait for the billing cycle to end, and then upgrade to your plan of choice. We are currently working on improving this feature and simplifying the process. In the meantime, you can email us at payments@spreaker.com and we can facilitate the upgrade for you. If you've subscribed to a Pro plan through Spreaker's app, you'll have to contact Apple for information on how to get a refund.